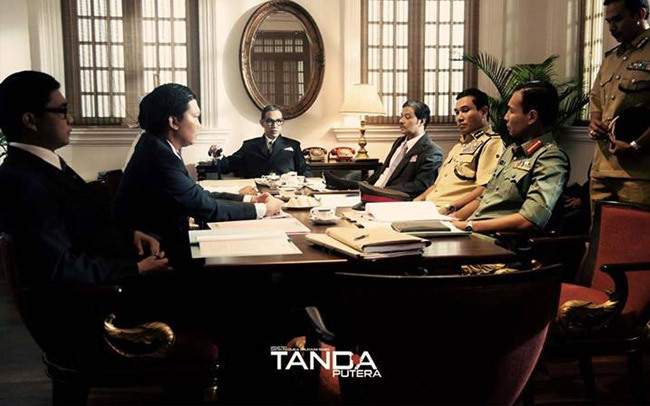 KUALA LUMPUR: The controversial movie Tanda Putera which opened just two days before the National Day last week did not show respect to Tunku Abdul Rahman and has done a disservice and injustice to the legacy of the Bapa Malaysia. Reviewing the movie on their website, umaandjoe.com, the famous duo movie critics, Umapagan Ampikaipakan and Johanan Sen felt that Tunku had been greatly undermined in Tanda Putera. Umapagan said that the movie is a propaganda because it glorified the second Prime Minister Tun Abdul Razak and his deputy Tun Dr. Ismail at the expense of Tunku. "The movie made Tunku look like a blithering fool. It made him look toothless. Two days before Merdeka you want to undermine everything that Tunku fought for? I think that is ridiculous. “Yes, Tun Ismail and Tun Razak were great statesmen but when you tell the story, you don’t undermine another leader. You don’t say Bill Clinton was great but JFK was a loser,” said Umapagan, referring to the two American presidents. Tanda Putera is set during the last days of Tunku and explores the rise of the young Turks in Umno amid the May 13 1969 riot. Tanda Putera, directed by Datin Paduka Shuhaimi Baba, was produced at a cost of almost RM5 million partly with a grant provided by FINAS and the Multimedia Development Corporation (MDEC). It was slated for release in September last year but the screenings were postponed following complaints that it fictionalised the May 13 riot. Shuhaimi defended the film for its historical accuracy but later admitted that it was her interpretation of the historical events. She had also repeatedly explained that Tanda Putera is a story about the friendship of Tun Abdul Razak and Tun Dr. Ismail during the testing times. Among those who questioned the film’s historical accuracy is Johanan. “It makes a mockery of our history and also of us because if this movie can get away with the liberties that it has taken, then, we obviously don’t know our history and our heritage as well as we should. “At a time when patriotism is very low and maybe with good reason, she (Suhaimi) has taken a head at it in a way that is just unforgivable,” he said. While the duo agreed that discourse over Tanda Putera is a necessity, they exchanged heated debates on how the discourse could be done and whether people would believe the history of May 13 as portrayed in the movie. “There is still a large section of the community which will believe this to be a factual representation," said Johanan before Umapagan replied: "And therein comes the debate." The latter also believes that "the movie will be a catalyst for that discussion”. The duo however did not mince their words when criticizing the movie as a work of arts including its technical aspects. Umapagan said that movie was so badly written and edited, that it looked like it was edited by a five-year-old while Johanan said it looked like it was edited by a first year associate producer. “The first half of the movie looks like an unfinished History Channel special without voiceovers done or without any proper historians being interviewed. It is just a re-enactment footage arranged together without proper narrative,” said Johanan. For Umapagan, the entire movie has no narrative at all. “It is very rare I watch a movie without any redeeming qualities but this is one of them. The storytelling is so bad. There is barely any dialogue. The movie is so badly written that it is only filled with punch line after punch line like ‘Oh, Cina potong’, ‘Oh Melayu mengamuk’. That is what really bothered me,” he said. UmaandJoe.com hosted the podcast movie review of the duo, who started the program on BFM radio under the name of ‘What The Flick’ before moving exclusively to the web.